Hamilton Island as we know it was made in the ’80s. A well-rounded beauty, Hamilton Island. 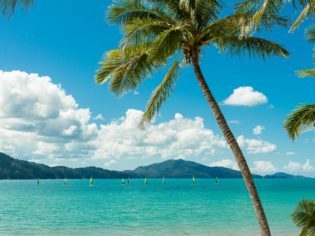 While decades earlier other Whitsunday islands prospered as tropical destinations (neighbour Hayman Island first became a fishing hotspot in the ’30s), Hamilton lay uninhabited in all nature’s glory, despite hundreds of years of intrepid explorers passing by. Tourism entrepreneur Keith Williams (the man behind Gold Coast’s Sea World) noticed the island whilst on board his yacht in the 1980s. Soon enough, he had purchased the grazing lease that granted ownership of the entire five-square-kilometre island, and began constructing a harbour, resort and the only commercial airport in the Whitsunday islands. No mean feat. Little did he know that almost two decades later and thanks to a generous cheque from Fosters for his wine-making business he would be the new owner. By this time the Whitsunday favourite wasn’t its usual shiny self, so Oatley poured millions of dollars into transforming Hamilton into a world-class destination. The striking Hamilton Island Yacht Club has accommodation perfect for families, an upmarket restaurant and deck perfect for relaxing afternoons. By 2010, the new and improved island boasted the Yacht Club and its luxury villas, a day spa, and the freshly renovated Palm Bungalows and Reef View Hotel. The makeover hadn’t finished yet either, with the boutique Beach Club getting it’s own facelift some years later. But the most notable addition was qualia – this six-star resort cost over $100 million to construct in a bid to fill the island’s high-end market gap. Part of the Luxury Lodges Australia, the resort was voted Best Resort in Australian Traveller’s People’s Chocie Awards several times and took out the coveted Conde Naste Traveller’s Best Resort in the world in 2012. It also boasts a guest list that includes the likes of Gordon Ramsay, Toni Collette and Oprah. If you hold a coveted qualia key, a quick swipe opens its Jurassic Park-like gates to reveal a tropical leafy haven. Guest pavilions blend into the surrounding gardens (which have become an attraction in themselves with guided tours), while inside hides a triumph in architectural sophistication and simplicity – allowing the view to take centre stage. A panorama of verdant greens and azure blues, interrupted by nothing but native gum trees… and the occasional camera lens – necessary for photographic evidence because words can fail here. For more check out our latest qualia review and a honeymooners report. Most days on the island will be spent in your togs; this is the Great Barrier Reef after all. Coral reef is only a short paddle away from the island’s main beach, Catseye. Here, schools of colourful fish can be seen at low tide. Green turtles are also common to the island and humpback whales can be spotted with their calves between July and October. Reportedly their calls can be heard at night; few places can boast that soundtrack. For the more adventurous, there are countless day trips from the island to prime snorkelling and diving sites – or you can even spend the night on the reef. If lazy beach days are more your style, pack a picnic and jump on a boat to Whitehaven Beach. Just 30 minutes in a high-speed catamaran brings you to this seven-kilometre stretch of pure white sand and pristine water. Walk to the far end of the beach for a secluded picnic spot where you can sip on Wild Oats wine between ocean dips. It’s not a bad setting for some romance – keep your eye out for a bended knee. Adventure seekers can head out for jet skiing, quad biking and a heli touring. 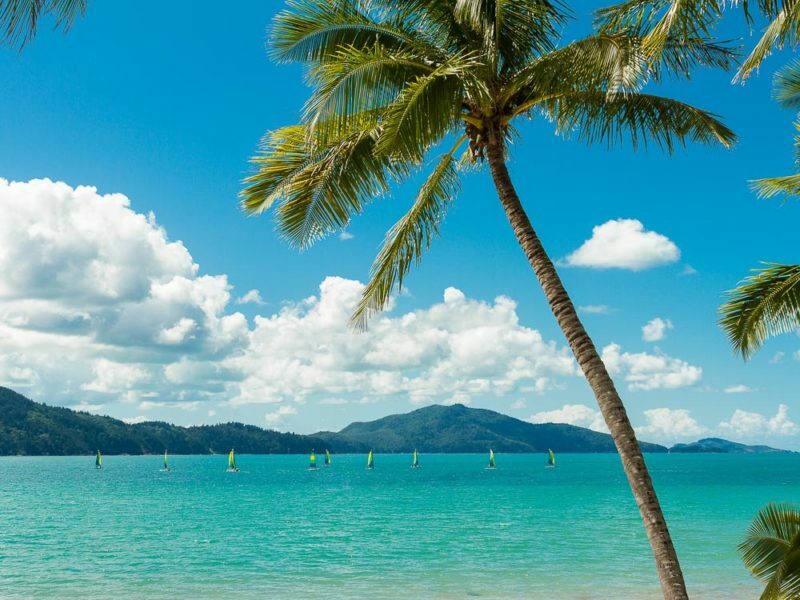 More sedate activities include mini golf, dinghy hire and unlimited entry to Wildlife Hamilton Island – one of the only places in the world where cuddling a koala is allowed. You may spot some in the wild too; more than 70 per cent of the island remains preserved as natural bushland, which you can explore along countless walking trails that lead to hidden coves and secluded lookouts. The 16th green at the Hamilton Island Golf Course, actually on Dent Island, have handicap destroying views. Better still, golf-nuts can play guilt-free as partners whittle away the day with lunch at the Club House. Getting around is as fun as it is easy; guests scoot around the car-free island on golf buggies, adding to the everpresent holiday vibe. With only 1200 staff and residents on the island, most people are here for a good time, and you can feel it. Even the staff are genuinely happy to serve you, which may have something to do with the Robert Oatley College, created to expand career opportunities – another initiative the Oatley family have integrated over the past 10 years to improve the Hamilton experience. Indeed, improved is quite the understatement. This ’80s baby is all grown up. Catering for diverse interests and oozing world-class sophistication, she allures people from all walks of life to her tropical shores – from Oprah to you. Your accommodation includes transfers to/from the island’s Great Barrier Reef Airport – keep an eye out for a sign with your name or hotel, it’s as simple as that. If you’re coming from Whitsunday Coast Airport (in Proserpine), book a transfer to Abel Point Marina in Airlie Beach where it’s a 30-minute boat ride to the island. Palm Bungalows – Short of getting a private house (check out hihh.com.au), these bungalows are the most affordable option. Positioned betweenCatseyeBeach and the marina, with bright and airy interiors set in tropical gardens. From $340 per night. Reef View Hotel – Located across fromCatseyeBeach with excellent views. Rooms are spacious and modern. From $360 per night for a garden view; $430 per night for aCoral Sea view. Beach Club – Intimate boutique accommodation onCatseyeBeach, designed for couples. From $570 per night. Premium Luxury: qualia – Set on the northern tip of the island with a private beach. Pavilions overlook the Coral Sea; some have private plunge pools. From $975 per night. Coca chu – This casual restaurant dishes up south-east Asian cuisine perched on the shores of Catseye Beach. Mains from $26; 07 4946 8580.